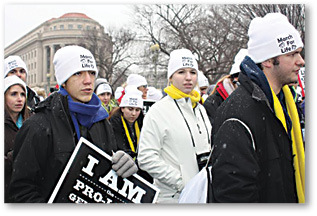 January 18 is the peak of a journey to Washington, D.C. filled with “prayer and sacrifice” for hundreds of youth from the Diocese of Baton Rouge, who will march up to the U.S. Supreme Court and call for the to end of legalized abortion at March for Life. 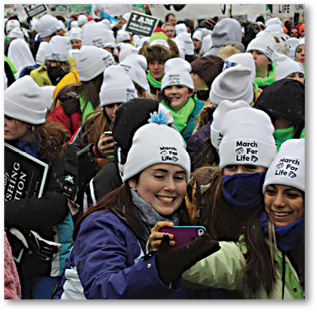 The day of the March is a highlight for the youth from the Diocese of Baton Rouge, who also visited many and historical and religious sites during a trip to March for Life in Washington, D.C. The 24-hour bus ride to the nation’s capital is a memory maker for pilgrims. A stop on the way to the march was scheduled to include the Dominican Sisters of St. Cecilia motherhouse in Nashville, Tennessee. Some of the sisters were scheduled to board the bus and accompany students for the rest of the march. While in Washington, D.C., pilgrims planned to visit the Basilica of the National Shrine of the Immaculate Conception, the Cathedral of St Matthew the Apostle, the St. John Paul II National Shrine, the Smithsonian Museums, the Museum of the Bible, Arlington National Cemetery and the National Mall. Also on the itinerary for this year is a visit to the United States Holocaust Memorial Museum, which intrigues Verberne. “I am excited about visiting this place because I have always enjoyed learning about history; especially about the Holocaust,” said Verberne. “I’ve read multiple books on this topic as well as seen many documentaries to learn more about this time in our history.” There is a touch of home when the youth meet with their peers at the annual Louisiana Geaux Forth Rally. A chance to encounter mothers considering abortion occurs during a rosary walk at Planned Parenthood and at the White House. Going to March for Life is a way to join with thousands of other voices to amplify the pro-life message for Austin Bascom, a member of Ascension of Our Lord Church in Donaldsonville. “We will meet people who have the same standards and beliefs and make a difference in our society,” said Bascom. He is looking forward to learning more about respectfully talking with those who don’t share his pro-life values. Chelsea Buckley, a member of St. Paul the Apostle Church in Baton Rouge and student at Cristo Rey Baton Rouge Franciscan High School, and Joelle Benoit, a member of St. John the Baptist Church in Brusly, shared this hope for their first trip. “I want to help people see how precious life is and understand why it should be protected,” said Buckley. Sara Lavastida, a senior at St. Michael and member of St. George Church in Baton Rouge, is a fourth-time pilgrimage veteran. It was a bumpy ride the first trip, Lavastida acknowledged. The opportunity to share her pro-life views is Lavastida’s passion. But equally important is an opportunity to grow in faith and evangelize. “While the March for Life is about learning to respect life and about the crimes that have been or are being committed against life, I hope more to be able to experience the celebration of life and light that Jesus has given us with several of my friends,” said Lavastida. Stories from friends about the March prompted Kirstynn Bettencourtt, a member of St. George, to go on the march in 2017. “From the second I left, I knew this trip was something I would want to continue to go on for as long as I can,” said Bettencourtt. She still gets nervous that “something bad could happen,” but fully trusts God will accompany everyone. And the mission to spread pro-life values keeps her focused. “Many times, those who do not share my pro-life views are quick to jump to excuses on how it is a ‘woman’s choice’ or how ‘it is a fetus and not an actual baby’ or many other defenses. When people say things like this, it hurts my heart in ways I cannot put into words,” said Bettencourtt. “What I always say to these people is that no matter who you are or what you believe, as soon as a woman finds out she is pregnant, there is a baby growing inside. Whether that baby is wanted or not, they are here in this world for a reason. It doesn’t matter the amount of ‘what ifs’ or the ‘buts’ of the situation, the baby is alive and growing and all they are asking for is a chance,” she added.